Great companies align the development of their employees with the mission and path of the company. 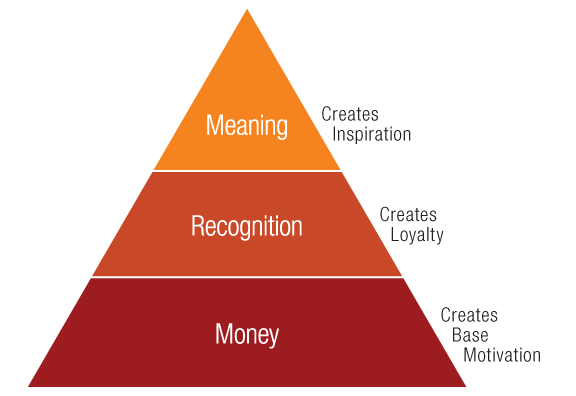 Our approach to employee engagement is based on one of the most iconic theories of human motivation: Maslow’s Hierarchy of Needs. Although employee engagement is an individual equation, we believe recognizing and addressing universal human needs is a great place to start. We show you how to tap into the meaning needs of employees, moving them from having a job to pursuing a career to living a calling. We also distinguish the various roles employees, managers and executives can play to increase engagement. To increase your ability to engage and attract top talent by addressing employee’s higher needs. To understand which employee needs you, as a manager, and as an organization, tend to pay attention to most. To prioritize managerial and organizational practices that creates a culture of meaning. To create a detailed, measurable action plan. This add-on service offers a comprehensive, systemic approach to creating (or strengthening) an inspiring workplace. We work the executive team to ensure there is alignment between mission, strategy, values and the leader’s actions. We guide the formation and activities of culture teams until self-sustaining. We facilitate the organization (or specific departments or regions) to address any gaps between current values/behaviors versus desired values/behaviors.